President Donald Trump speaks during a meeting of the President's National Council of the American Worker in the Roosevelt Room of the White House, Sept. 17, 2018, in Washington. President Donald Trump on Monday declassified a trove of documents related to the early days of the FBI's Russia investigation, including a portion of a secret surveillance warrant application and former FBI Director James Comey's text messages. 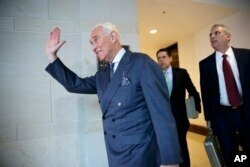 FILE - Longtime Donald Trump associate Roger Stone arrives to testify as part of the House Intelligence Committee's investigation into Russian meddling in the 2016 election, in Washington, Sept. 26, 2017. FILE - U.S. Justice Department official Bruce Ohr arrives for a closed hearing of the House Judiciary and House Oversight committees on Capitol Hill in Washington, Aug. 28, 2018. "Transparency wins. This is absolutely the right call from (at)POTUS," said Rep. Mark Meadows, a North Carolina Republican, on Twitter. Meadows, who had pushed for the documents' release, said it will allow the American people to decide "what happened at the highest levels of their FBI and Justice Department." 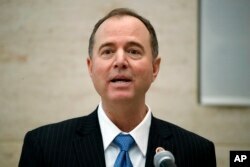 FILE - Rep. Adam Schiff, D- Calif., ranking member of the House Intelligence Committee, speaks at the University of Pennsylvania in Philadelphia, Feb. 1, 2018.